Evil has cleared the Eastern Seaboard of human life and now is turning his attention inland. Meanwhile Dr Price and Dr Young are now charged with putting a stop to the undead maniac. 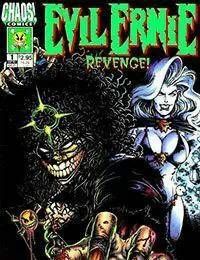 They explore the very beginnings of Ernies undead rampage and come up with a plan to take him down and sever him from the power that keeps him going once and for all. Smiley buttons personality starts to come to the front as he advises Ernie on tactics and the special relationship between them is explored. Meanwhile in Hell Lady Death is tormented by visions and is unable to control her own kingdom as a winged tormentor haunted her every move.